This exquisite new build home is a style sanctuary, offering a modern mix of panache and practicality. 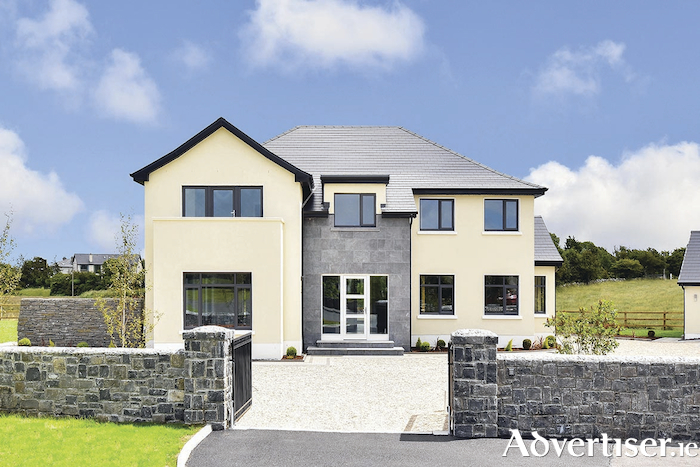 Amorel, which means ‘by the sea’, is situated on the shore of Galway Bay in an exclusive gated development, and is just 1km from Oranmore village, close to Renville Park, Galway Bay Sailing Club, and Renville Golf Club. The stunning site of c0.7 acre is private, mature, and has professionally landscaped grounds. Colour, texture, and beautiful materials used in the gardens have complemented the site wonderfully. Spanning 3,500sq ft, Amorel has been thoughtfully designed for a family, with lots of sunshine space, incredible bay views, and high end finishes, with an A rated energy assessment. The stylish entrance hall has striking organic natural stone feature wall and is the first indication of the stunning interior at Amorel. The main living area has been designed to incorporate kitchen/dining space with a family living area which can be connected or separated by means of a floor to ceiling 'moving wall’ sliding door. The glass wall feature of the kitchen area invites the view inside and this is truly a spectacular aspect of this home. At any time the kitchen can be opened up for al fresco dining close to the water's edge, via full scale glass doors. A beautiful wide window seat is the perfect chill out zone for family during meal prep time. The kitchen design provides the functionality of a working kitchen but from a visual point of view it has serious wow factor. This same style continues into a fully fitted large utility area. The connecting living room enjoys the same scintillating views and is a large family area with Gazco stove. A spacious formal living room is across the hall and has remote control feature glass and stunning oak doors, descended coving, feature display units, a stunning insert fire, and an impressive 60” TV fitted into wall area. A guest bathroom features the natural stone wall and incorporates shower wall wetroom. There is a super size guest room/playroom on the ground floor also. At first floor the landing is spacious bright and continues the same elegant style. A master bedroom is complete with walk out balconette, an impressive fully fitted dressing room, and a beautiful en suite. The luxurious family bathroom has a separate glass shower enclosure and a gorgeous stand alone deep fill bath. Each of the three remaining bedrooms (two en suite ) is thoughtfully appointed to maximise views of the gardens, the bay, and the village. The completed grounds are an oasis of garden style and incorporate a large garage, sand pebble drive, and wraparound patio. According to the agent Amorel is the result of a well planned design which makes an immediate and lasting impression and takes full advantage of a spectacular site and its wonderful views. There are delightful textures and tones here but it is not overwhelmed by conflicting elements. Contact Keane Mahony Smith at 091 563744 for viewings and further information.